Hanoi has the typical weather of the North Vietnam. There are four different seasons, Spring, Summer, Autumn, and Winter. Each season will bring you different yet beautiful experience for your vacations. Autumn is considered as the best time to visit Hanoi when the weather is less humid and cool. 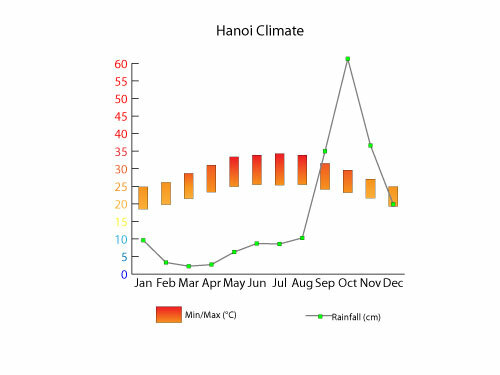 September to November are recommended months to travel to Hanoi because the weather is cool down compared to summer but the sky is still blue. In this period, you can also enjoy the joyful Mid-Autumn Festival. t is hot and sticky in the summer months (May-Sep) with the common temps of 36°C (86-97°F), but is perfect for lazing and sun baking on the pristine beaches around Hanoi including: Ha Long Bay, Cat Ba Island, Do Son Beach, Tay Thien Mau, Khoang Xanh, etc.